The Aurora Borealis, or Northern Lights, are an interesting phenomenon which we never grow tired of watching at our resort. 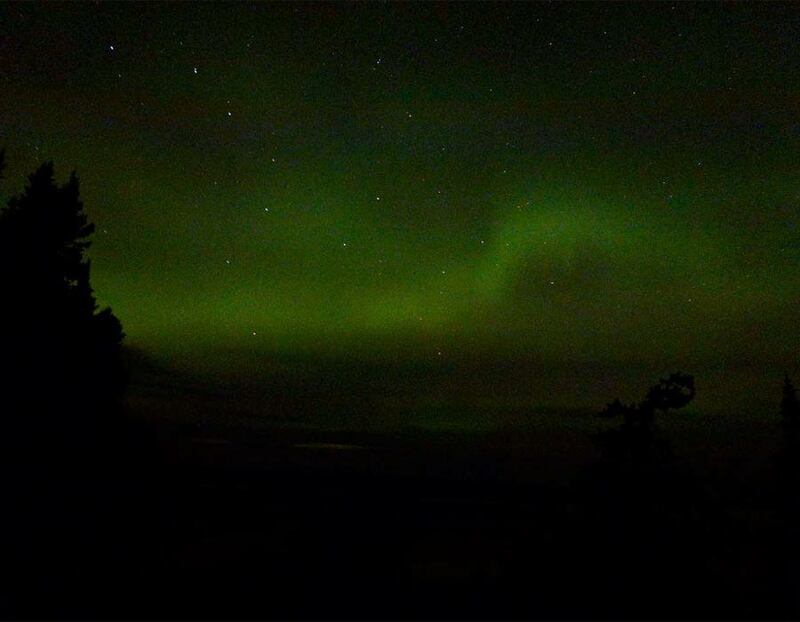 Errington’s remote location at the top of the Canadian Shield, the oldest mountain range in the world, is great for seeing the Aurora Borealis. The slightly higher elevation, clear air, and total lack of light pollution allows us to see incredible night skies. We see so many stars that many of the constellation are more difficult to pick out than in more southern locations. Very intense Northern Lights are like a gossamer curtain of ghostly colours that appear and disappear in patterns that are incredibly captivating and wholly unpredictable. Although we see spectacular Northern Lights on many occasions, it can be difficult to do long-term predictions of the quality of the Aurora because of the effect of solar activity on their intensity. About once week, we see excellent Northern Lights; but that doesn’t mean they are predictable. At times, we’ve gone a couple of weeks with less intense Northern Lights, and then a number of nights with incredible lights! But on every clear night, we have dark skies perfect for stargazing. There are some conditions, however, which make good Northern Lights viewing more likely. For better viewing of the Aurora Borealis and the stars in the night sky, you should plan your vacation time for the least amount of moonlight. Also, the later, or earlier in the season you plan your vacation, the better. The night gets darker faster and the cooler air is more likely to be clear and haze free. Really spectacular Northern Lights happen only occasionally when the sun produces significant solar activity including solar flares which interact with the earth’s magnetic fields. Remember, June 21 is the longest day and shortest night of the year and when you get as far north as we are, this change in daylight is very pronounced. You should be prepared to stay up until at least midnight and perhaps 1:00 am or 2:00 am for the best chance of really good viewing of the Aurora Borealis if you are staying at our resort in late June to early July. In May, late August and September we see Northern Lights as early as 10:00 pm.